Coat by comma,. New, fashionable cut. 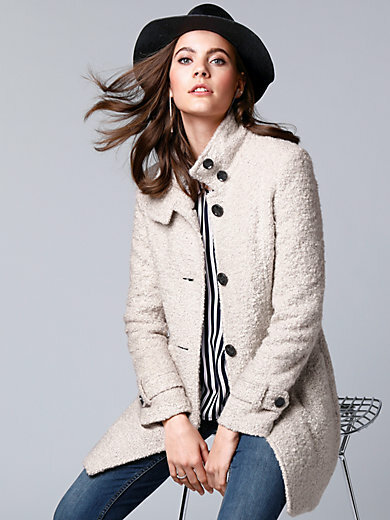 A super-soft coat in cuddly bouclé yarn. Slightly longer cut. Figure-flattering dividing seams. Feminine stand-up collar with button fastening. Decorative buttons on button placket, side tabs and sleeve tabs. Two pockets. One inner pocket. 79% acrylics, 16% wool, 5% polyester. Lining 100% acetate. Sleeve lining 100% polyester. Length approx. 33 ins. Dry clean.